The meanest version of the Audi RS5 Coupe has just got a gorgeous makeover treat at our Revol studio. At a glance it is easy to see by its intense mirror-shine that it has the fullest protection of ZeTough, the premium, long-lasting paint protection coating. The RS5 Coupe is viciously quick with meaner firepower than before. 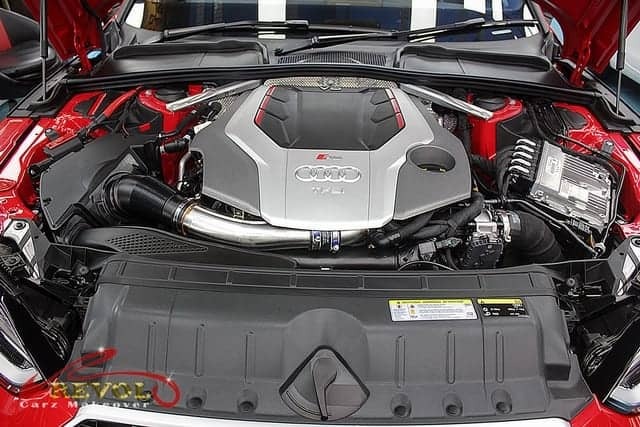 Under the clamshell hood sits a potent 2.9 TFSI V6 Bi-turbo, 444-horsepower engine with which its fast-acting, eight-speed automatic transmission catapults the four-wheel drive from 0-100km/h in just 3.9 seconds. Top speed is nominally limited to 250 km/h. 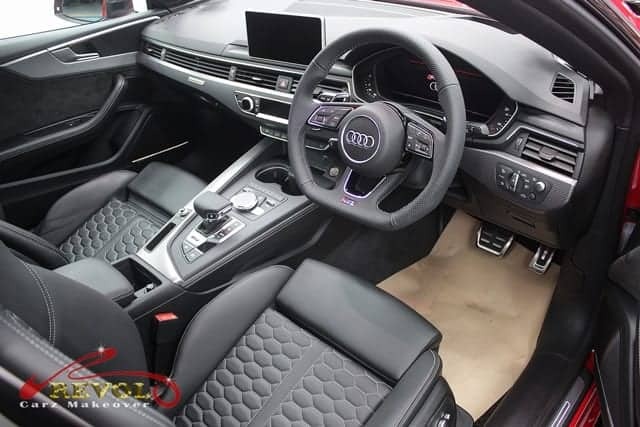 On the exterior, the RS5 Coupe boasts a sporty accents front styling with massive air intakes, wide fenders, oval tailpipes, surface-mounted spoiler lip and rolls on 19-inch alloy wheels. The side-vented LED headlamps sharpen the appeal. The cockpit is supremely comfortable with an array of top-notch materials and high-tech gizmos. Audi’s clever Virtual Cockpit System offers user-configurable displays including 3D navigation in brilliant colors. 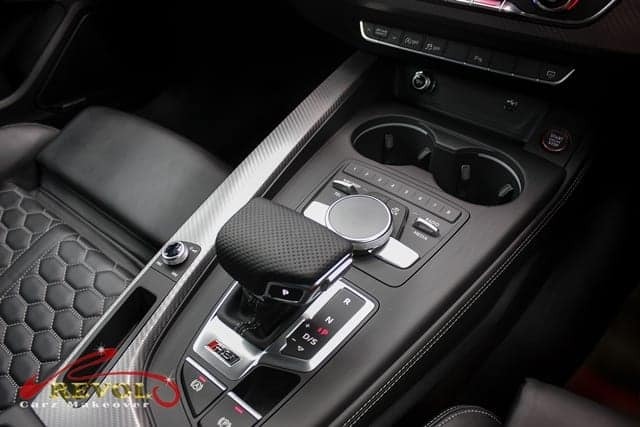 Come aboard and experience the thrills of Revol’s Makeover with us on a virtual tour to our studio to wow at the transition of the pink Audi RS Coupe to a head-turning showroom worthy beauty. The elegant Audi RS5 Coupe sparkles after professional Revol Makeover with treatment of ZeTough Ceramic Paint Protection Coating. ZeTough Ceramic Paint Protection Coating brings the RS5 to life. The massive air RS inlets and single-frame radiator grille with honeycomb design characterize the front end of the Audi RS Coupe. The manually polished LED headlamps are better than brand new. Cleaning and polishing the engine bay to such perfectly new condition motivates our passionate detailers. 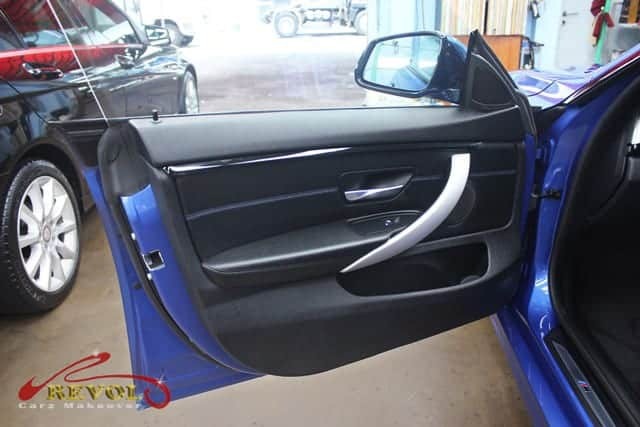 You can’t blame our detailers for being perfectionists when it comes to sprucing up your car. They get down to the last detail in ensuring your interior is ultra-clean, sanitized and the plush Alcantara leathers conditioned. The meticulously clean console deserves your compliments. 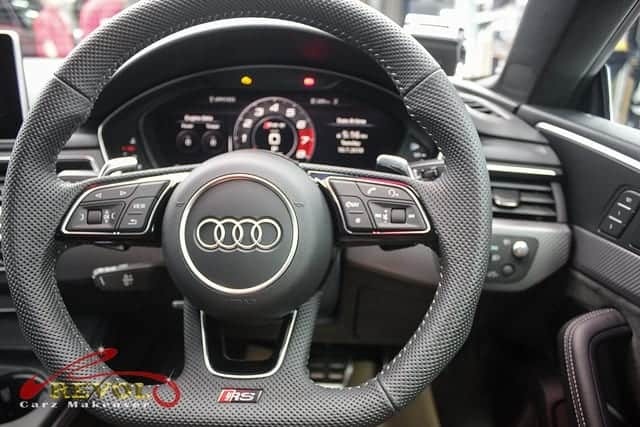 The cleaned, leather wrapped RS Steering wheel certainly adds to the driving pleasure. 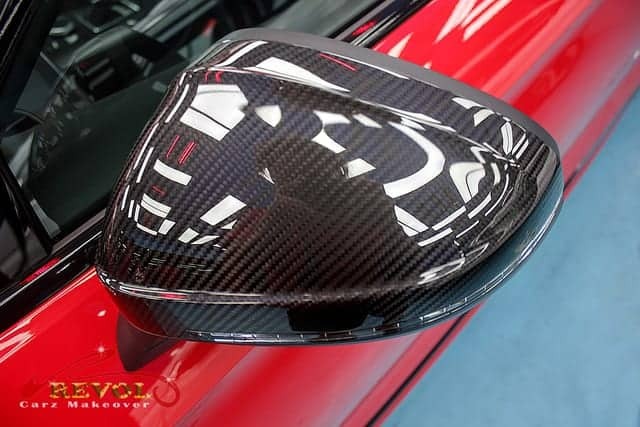 The exterior mirrors get a carbon fibre optic finish and the radiating mirror-shine with a touch of ZeTough Ceramic Paint Protection Coating..
Now you see. Now you don’t. The nasty finger-nail scratches around the door handles are things of the past with the coat of diamond-hard ZeTough Paint Protection. Our egos soar when your car shines like this. At the rear, the RS5 Coupe gets wider fender, a subtle boot lid spoiler and a uniquely styled bumper, high-gloss black diffuser and signature oval tailpipes. Signature oval tail pipes – polished like brand new. The finale of Revol Makeover with the 19-inch wheels in matt aluminum fully restored to showroom quality finishes. 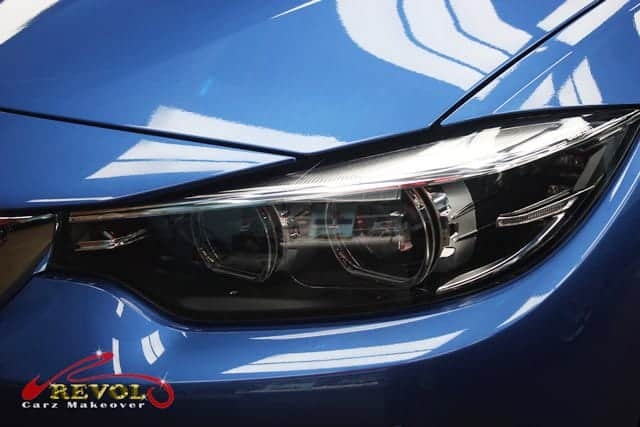 If you’re looking for the finest perfection in car detailing and ultimate paint protection in Singapore, Revol Carz Makeover is your right choice. Our customer satisfaction is priceless. Every smile we put on our customer’s face warms our hearts. As you can see to believe, the Audi RS5 Coupe turns out even more stunning than its previous showroom condition after the Revol makeover. And it will remain shiny more permanently too. ZeTough makes the difference. The incredible long lasting protective coating promises you a lifetime of paint protection. There once lived a lovely BMW 523i XL with gorgeous body. She reigned over the majestic highways and turned everyone’s head in awe as she whizzed by like a rushing wind. Sadly though, her royal beauty seemed to be fading away slowly into an unknown horizon. Her once flawless coat of paintwork began to dull, slowly showing signs of ageing due to prolonging neglect. Her front bumper suffers painful deep cuts and her once-glorious sheen is replaced with more and more scratches and dents, showing dulling appeal. People who once adored her now no longer cast a second look at her pathetic silhouette. Like most fairy-tales with happily-ever-after ending, her discerning owner finally noticed her plight. He gently brought her to Revol Carz Makeover for a magical restoration; ordering not only a coat of new premium BMW paint but also restoring her majesty from bumper-to-bumper with a powerful glass-like coating of ZeTough Ceramic Paint Protection that promises an ever long-lasting show-room shine. The BMW 523i XL is beautifully restored to her royal perfection like a dream. Yet this is not a tale but happens real in world. 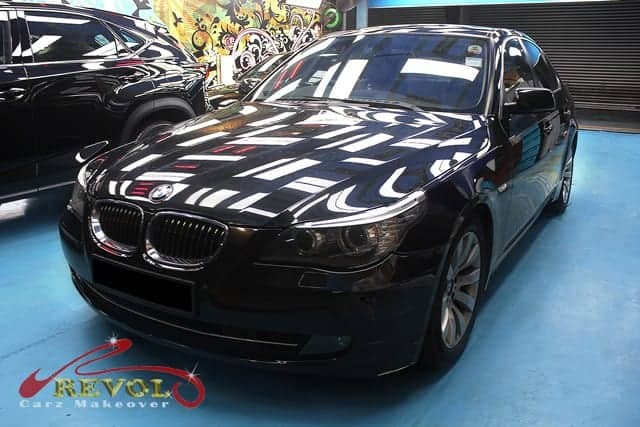 Hop in and ride with us to a virtual tour of Revol Carz Makeover studio and discover the real-life transition of the BMW 523i XL to a glorious showroom condition. The BMW 523i XL arrives at Revol Carz Makeover for a new coat of paint and total grooming. The paintwork on her front bumper had peeled off and her body showing dulling appeal. Components such as the tail-lights, bumpers, wheels, badges, door seals need to be dismantled in preparation for the repainting. 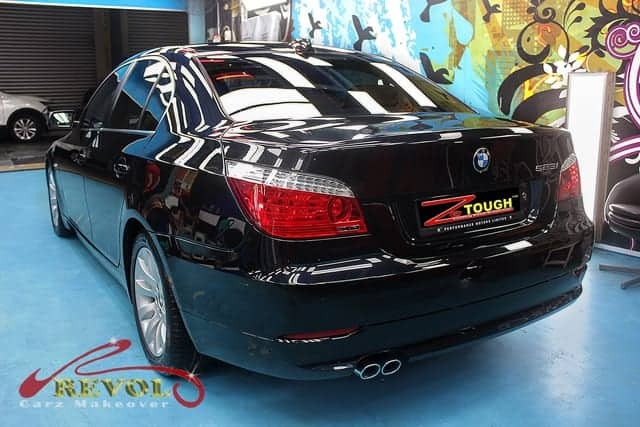 Brace yourself and wow at the beautiful transition of the BMW 523i XL after a new coat of premium BMW paint and treatment of ZeTough Ceramic Paint Protection Coating. Her spectacular front hogs the limelight with iconic kidney grills, BMW badge and Zenon headlights. Skilled manual polishing which results in crystal clear and bright headlights. Peek into her heart and you will agree it is flawlessly clean and pure after the makeover. The 523i insignia doesn’t mean the car is powered by a 2.3-litre engine but a 2.5-litre unit. The wing mirror was covered with water-mark stains before the makeover. See a world of a difference after the incredible makeover? Do you feel exasperated by finger-nail scratches all around the door handles? Don’t despair. With the glass-like shield of ZeTough Ceramic Paint Protection Coating, finger nail scratches cannot touch the door handles ever again. You are excused if you gaze at her rear a little too long. Indeed her rear view is just as gorgeous. Take a closer look at the sizzling beauty of the restored BMW 523i XL before she rides into the happy-ever-after horizon. The 523i features twin tailpipes on the left hand side but these really need urgent restoration. 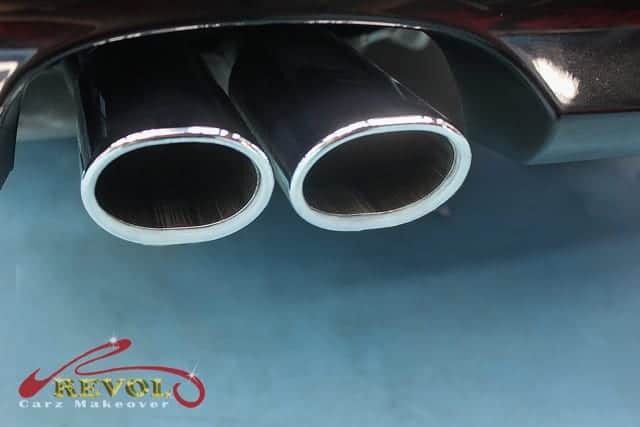 We manually polished the twin tailpipes by hand to achieve this awesome new look standards. All the wheels need to be dismantled for professional cleaning and restoration. 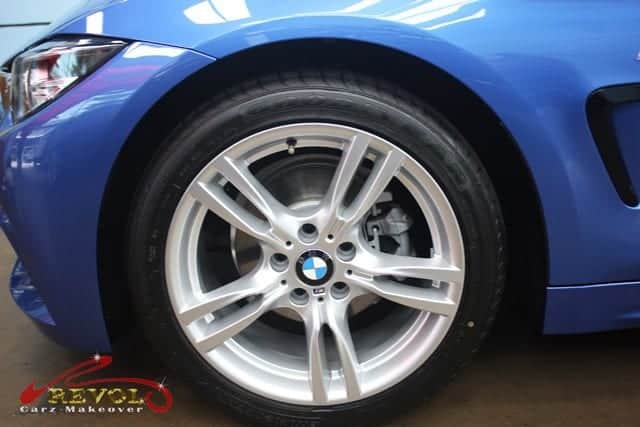 All the 17-inch alloy wheels are now restored to brand-new showroom standards for the grand finale. We thank all our satisfied customers for their positive reviews that say volumes of Revol Carz Makeover. 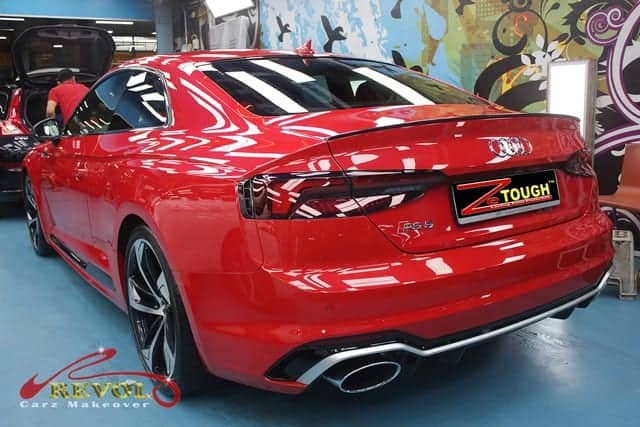 Express your distinction in the finest perfection in car detailing and paint surface protection with our proven, ZeTough Ceramic Paint Protection Coating that gives the best value for money. 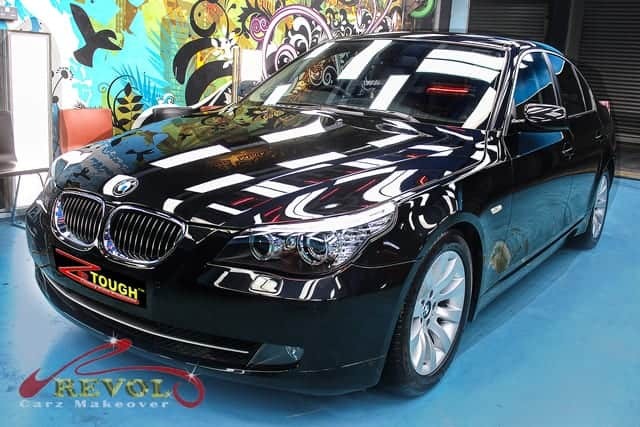 See to believe how we transformed the BMW 523i XL like a dream car again. The amazing result speaks for itself. The BMW turned out more spectacular than its previous showroom condition after the professional Revol makeover. And it will remain ever shiny with greater permanence too. ZeTough Ceramic Paint Protection Coating truly makes all the difference. The incredible long lasting protective coating promises a lifetime of paint protection. 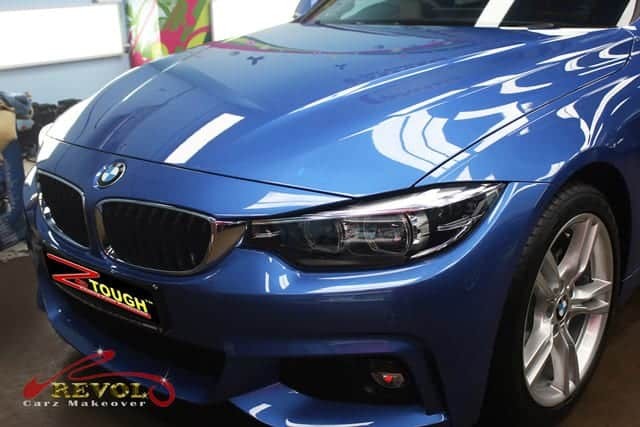 There is nothing quite like the brilliantly smooth shine of the new BMW 420i Gran Coupe after the must-have treatment of ZeTough Ceramic Paint Protection Coating at Revol Carz Makeover’s studio. The new BMW 4 Series Gran Coupe received a much needed face-lift. Other than subtle changes to the face and rump, the headlights, rear and fog-lights are now in LED. Inside, there are changes to the dashboard, a new steering wheel and an updated version of BMW’s iDrive infotainment system. The Munich manufacturer has also tweaked the handling characteristics by lowering the car’s centre of gravity by 30mm, widening the front end and rear tracks. 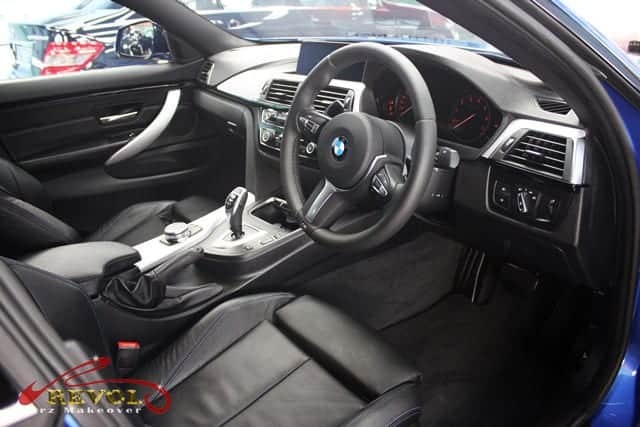 The BMW 420i Gran Coupe gets a 1998cc, 16-valves, inline-4 turbocharged petrol engine that generates a maximum 184bhp (at 5000rpm) of power and a maximum torque of 270Nm. Mated to an 8-speed automatic gearbox, this beauty boasts of a century sprint in 7.3 seconds and a top speed of 236km/h. 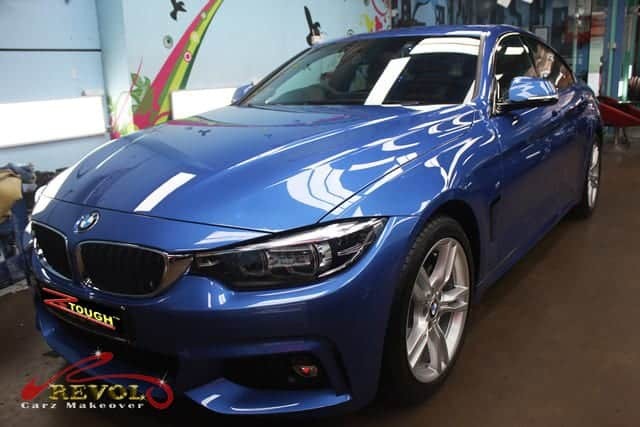 Come, hope aboard and let us take you on a virtual tour around our studio to view the step-by-step makeover of the BMW 420i Gran Coupe and transforming her to a gleaming, awe-struck beauty. 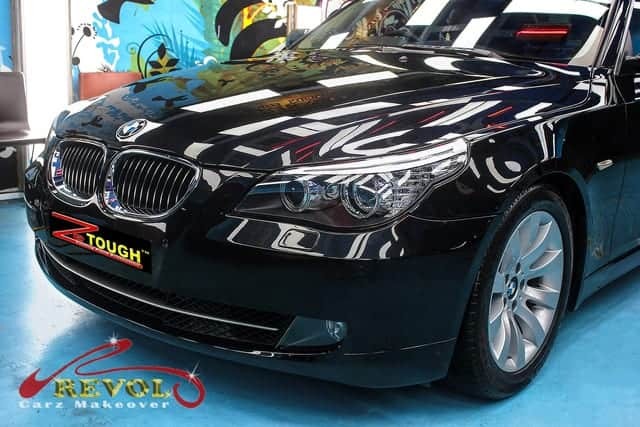 ZeTough Ceramic Paint Protection Coating keeps the BMW gleaming and looking its best for longer. After the ceramic paint protection is fully cured, the high-gloss front looks absolutely stunning with the new design kidney grille and front bumper with specific design elements. The ultra-clear LED headlamps are polished manually. 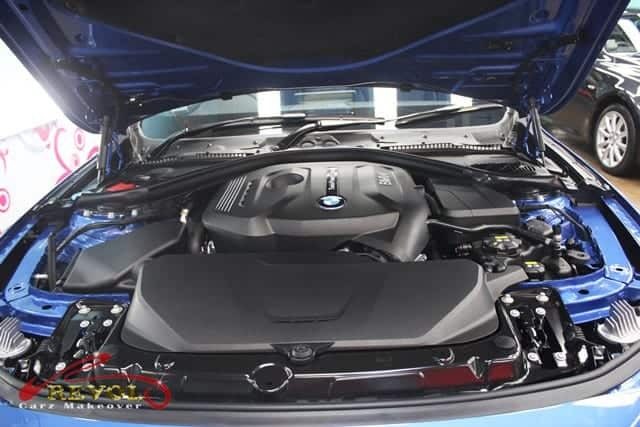 Our detailer-gurus’ most satisfying reward is presenting a super-clean engine bay. The standard of the interior tells volumes of the detailers. 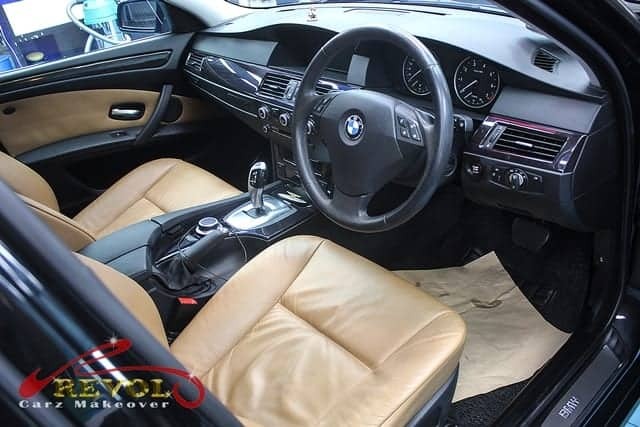 Every inch of the interior is passionately detailed, freshened and deodorized. The door sill finishers are cleaned and polished to look like always brand new. Every car at Revol Carz Makeover deserves the best paint protection coating. The finished work on the BMW 420i Gran Coupe turns heads at every corner. The new LED tail-lights look like fiery rubies after manual polishing. The high-gloss specific-designed rear bumper and the tail-pipes draw your attention after detailing. 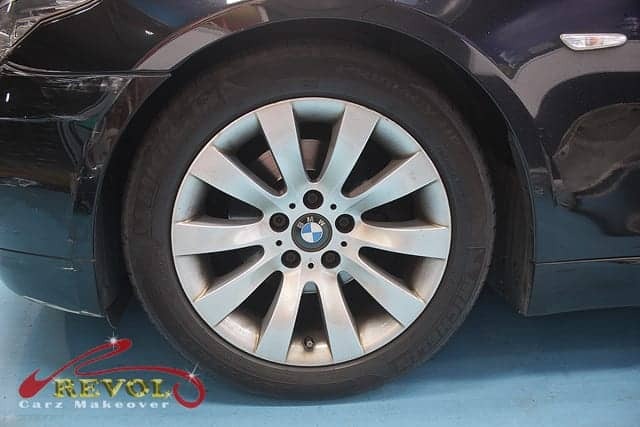 BMW’s 18″ light alloy wheels Multi-spoke style 416 are showroom standards after full restoration. No other coating can match the level of slickness, durability and protection against UV damage, hard water spots, bird droppings and elements associated with everyday driving than ZeTough Ceramic Paint Protection Coating. Worthy of the long-lasting investment for your car, the proven coating resists dirt and road grime better than tradition paint protection. Your car stays cleaner for a longer period of time and is extremely easy to wash and maintain. Please kindly be informed Revol Carz Makeover will be closed from 5th Feb 2019 to 14th Feb 2018.
Business in our Ang Mo Kio branch will be officially open from 15th Feb 2019 (Friday) and Toh Guan branch will be open from 18th Feb 2019 (Monday). 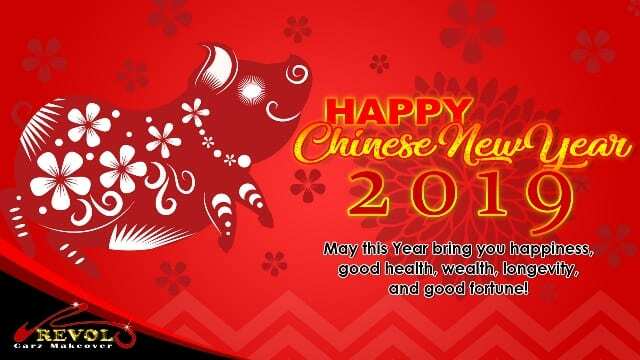 Wishing you and your family a Happy New Year of the PIG, Gong Xi Fa Cai! May an abundance of good fortune, good health, happiness, success and prosperity be yours throughout the year!